After nearly four years of negotiations, the Colombian government and the country’s biggest guerrilla group, the Revolutionary Armed Forces of Colombia (FARC), reached a historic final peace agreement last week, putting an end to the longest internal armed conflict in the Western hemisphere. The agreement envisions the creation of several transitional justice measures – included in what is known as the “Victims’ Agreement” – aiming to fulfill victims’ right to justice, truth, reparations and guarantees of non-repetition. These measures are to be put into motion if the agreement is ratified in a national plebiscite, to be held on October 2nd. On the International Day of the Disappeared, we direct the spotlight to one of the measures agreed to under the transitional justice umbrella: the creation of a special unit that will search for, locate, and identify those who were disappeared or went missing during the 50-year armed conflict. 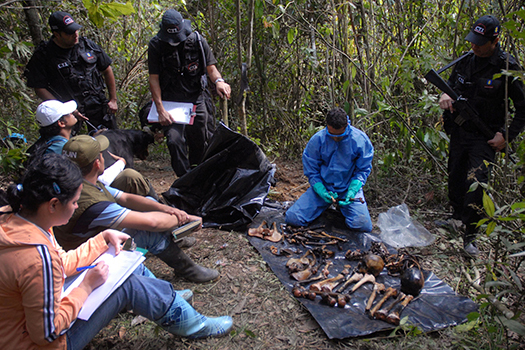 Agreed by the negotiating parties in October 2015, the creation of the Search Unit for the Missing (Unidad de Búsqueda de Personas dadas por Desaparecidas) will mark a significant step forward towards addressing a heinous crime that has for long remained hidden in Colombia. It is estimated that more than 46,000 people have been forcibly disappeared during the armed conflict. However, many more went missing under other circumstances related to the conflict, such as those who died in captivity after being kidnapped for ransom and combatants who were killed and anonymously buried in conflict zones. Combining all kinds of disappearances, the figure would rise to more than 100,000 people. The special unit will look into this broad range of disappearance cases, a complex task that will require extensive funding, staff and technical expertise. “Creating a dedicated, ad-hoc unit will be very important because so far the State has shown only very slow advancements, not only in locating the remains but also in shedding light on the phenomenon of enforced disappearances,” adds Moreno. For decades the families of victims of enforced disappearance have been very vocal in their struggle for acknowledgment and government action. They hold high expectations for the creation of the special unit, but also harbor some mistrust – it is not the first time a body has set out to search for Colombia’s disappeared. As a result of the tireless demands of the families, a law in 2000 mandated the creation of the National Search Commission for the Disappeared (Comisión Nacional de Búsqueda de Desaparecidos), tasked with investigating crimes of enforced disappearance. However, the commission always lacked essential economic and political support, and families of the disappeared found it deeply disappointing. It solved very few disappearance cases, and many of the procedures victims envisioned were never implemented. “What we expect from the new unit is that it won’t repeat past mistakes,” says Andrea Torres Bautista, lawyer for the Nydia Erika Bautista Foundation, in reference to the National Search Commission. Andrea’s aunt was disappeared in 1980, and since then she and her mother Yaneth have embarked in a quest for justice and truth about Nydia Erika’s disappearance by the Colombian armed forces. The foundation now supports families of victims of enforced disappearance in their struggle for justice, truth, and reparation. “We hope that there will at last be an institutional body that will do what no other has done before: provide information to the victims’ families about the procedures that are being developed to find all the missing people in Colombia,” says Torres. Torres stresses that the role of victims’ families should not be passive. “Families should advise on the creation of these entities and participate actively, because they are the most experienced in working on the disappeared,” she says. Searching for those who were disappeared or went missing during the decades-long conflict will present great challenges, explains Diana Arango. Arango is executive director of Equitas, the only independent organization in the country with forensic expertise. Arango also points at the need for a “robust” bank of genetic profiles, so that those who are found can be identified and returned to their families. She adds that it is essential for the state commit to respecting people’s customs and beliefs to ensure the remains are returned in a dignified way. Both families and experts agree that sustainable peace is impossible without seriously addressing the issue of the disappeared and missing in Colombia. Managing victims’ families’ expectations, gaining their trust and responding to their needs will be key for the success of the special unit. The information the unit gathers from all armed actors – the military, FARC, paramilitary groups and others – from victims’ families and from other resources will be fundamental in that process. 1985: Siege of the Palace of Justice Members of the guerrilla group M-19 sieged the Palace of Justice, home to Colombia’s Supreme Court. The military intervened, and once the standoff ended all the 30-40 guerrillas were killed, along with a number of hostages and 11 members of the Supreme Court. Following the raid, many survivors were taken away by military officials and never seen again. Some officials have been prosecuted for these disappearances. 2000: National Commission for the Search of Disappeared Persons Colombia passed legislation establishing a central body to investigate the disappeared, and authorized it to build a central registry of the missing. However, few cases have been resolved as a result of the body’s work. 2005: Justice and Peace Law Colombia passed the Justice and Peace Law, a mechanism designed to offer members of paramilitary groups incentives to disarm, such as reduced prison sentences in exchange for confessing their crimes and contributing to victims’ reparation. The confessions generated by the JPL led to some notable gains, including a record that identified 400,000 victims by name. However, the public lost confidence in the process, which was seen to be falling short in holding perpetrators accountable and establishing the truth about the disappeared. 2008: “False positives” scandal News emerged that the army murdered civilians before dressing them in rebel uniforms and presenting them as guerrillas or paramilitaries killed in combat. The number of victims is believed to be in the thousands. Some military officials are being prosecuted for these crimes. 2015: Exhumation in Medellin In July, authorities began to unearth what is believed to be the largest urban mass grave, holding the remains of as many as 300 disappeared. 2015: Agreement 62 Announced in October, Agreement 62 saw the Colombian government and the FARC lay out short- and long-term measures to establish the truth about the disappeared. It established a number of immediate efforts to locate and identify the disappeared and deliver their remains to their families while also calling on the creation of a special Unit to search for the missing.